Blog - The First Ever U.S. Palladium Coin Is Almost Here! The United States Mint has been in existence for 225 years, but it has never struck a coin in palladium – until now. Numismatists were excited when Congress authorized the first-ever Palladium Eagle coin back in 2010. There has been growing demand and anticipation ever since. After years of planning and preparation, this coin is now coming to fruition. The U.S. Mint has struck a limited number of first-ever palladium Eagles and is about to release them to the public. These Palladium Eagles represent an important event for bullion investors and collectors alike. Never has there been a palladium bullion product issued and guaranteed by the U.S Government. If you’ve been looking for a way to invest in this rare metal, the Palladium Eagle is one of the most secure and liquid forms. From a collector’s standpoint, the Palladium Eagle is a dream come true. 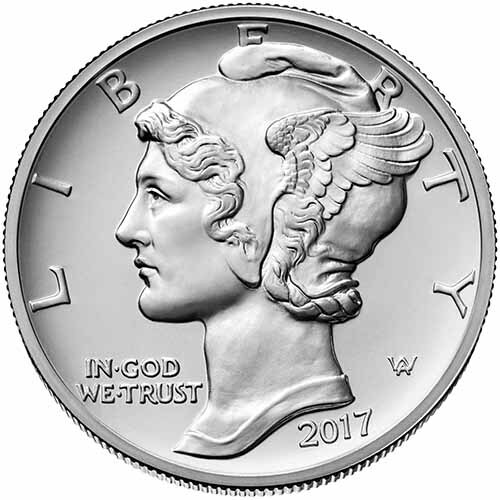 The coin’s obverse design is a gorgeous recreation of the 1916-1945 Mercury Dime motif. 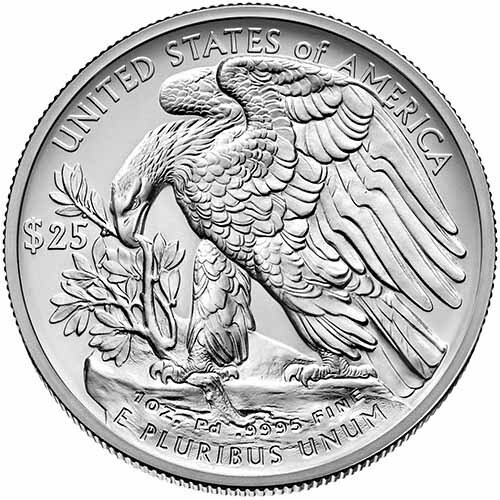 The reverse features a new image of an eagle grasping an olive branch. Not only is this coin beautiful in appearance; it will also be extremely scarce. We have no official word on the final mintage, but we expect it will be well below 50,000 and possibly more like 15,000 to 25,000. This is extraordinarily low for any modern coin. Here’s what we do know: the U.S. Mint has officially announced that there will be just one release of Palladium Eagles in 2017. Once this first batch is spoken for, there will be no more. We are allowing our clients to secure a limited quantity of 2017 Palladium Eagles on a pre-sale basis. We cannot emphasize this enough: quantities are very limited and premiums are not guaranteed to remain at these levels. Due to the immense demand for this new coin, we would not be surprised if premiums climb both on a short-term and long-term basis.